“The markets are looking bearish and it can fall further. I shall wait and watch and shall invest only when they start turning positive”. This is a not something which is unusual with the investors in stock market. Mostly people change their profession when it comes to investment in Share Market whether directly or otherwise thru mutual funds. They are Doctors, CAs, Engineer MBA etc. but as an investors in share market they become astrologers and try to predict market’s future. 1. Mansoon is not good this year and markets will touch 12000 very soon. 2. Markets will witness turbulence during diwali as it happened last year, so that time I will invest. Lets withdraw and invest agains when the markets go down. 3. I missed 8000 levels, I believe they will go up and hence lets put everything right now. 4. And these days Greece, US, Europe & Gold are in Highlight. These statements are no more than sheer guess work which can only be right if you are too lucky. 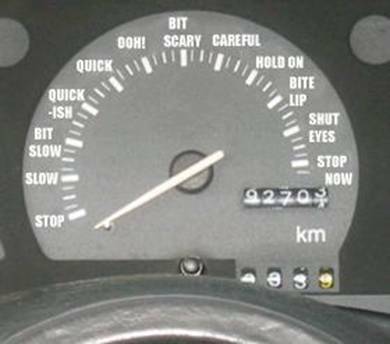 But mind you, even stop clock is right twice a day. However, expert after expert has gone on to say that trying to time the market is a fool’s game and should be avoided at all costs – but few so called experts keep trying. The below charts further highlights the point. You can see value of their investments on 30th August 2011 – Smart Guy Rs 3.84 Lakh (16.23%) & Dumb Guy Rs 3.41 Lakh (14.42%). A difference of less than 2% – even when w lucky have assumed that someone can be extremely lucky to catch all bottoms & another can be so unlucky that he always invest on peak. You can just imagine what would have happened if this Dumb Guy would have used root of Systematic Investment Plan – difference in returns would have been negligible. During the last ten year period, if an investor would have missed out the ten best days in the stock market, a sum of Rs 100,000 would have returned only a sum of Rs 133,592 as opposed to Rs 349,256 had he stayed fully invested. Even missing the two best days would have lowered his final figure by a significant 23%. And Greed & Fear will make sure that you miss best days. The moral of the story is that it pays to remain invested for the long haul rather than trying to move in and out of markets in an attempt to try to time them. Markets will rise and fall but by investing at regular intervals you’ll make sure that you get the benefits of buying low as well as catch the long term trend which is upwards. By the way until today nobody has got Nobel Prize in economics for a theory on “predicting tomorrow’s stock prices today.” You can try your Luck!! It’s “time in” the market that creates wealth. You have stated the most fundamental rule of wealth creation. This rule has also been repeated again and again by most market gurus but it is a pity that most investors don’t follow this rule and always try to time the market. Even after repeatedly failing in their attempts to time the market they never seem to give up in the hope that some time they will be successful and make a killing. The example which you have given clearly demonstrates that even if one is sometimes able to time the market by luck it hardly makes much difference in the long run. I only hope that atleast some investors will get the message and try to remain invested over a long time. But then for many long term means investment horizon of only around three years. I wish that this Diwali Godess Saraswati bless us all as Laxmi is only its shadow, which will follow once Saraswati enters our life and homes. Understanding where I stand is the first step that has to be taken before I plan to reach some goal. This article reminds me of a vary old and popular fable from Panchatantra, the great work of Indian intellect by Pt. Vishnu Sahrma about a race between the hare and the tortoise. He also said the same thing ‘time in the markets’ – keep on walking at a steady pace (disciplined investments)- rather than sprinting and exhausting all your energies, akin to timing the markets, in short bursts – will eventually help you reach the post first. 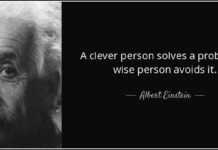 There is so much wisdom in our texts and we just need to be innovative in applying to our new circumstances….the wisdom is eternal and will find its usefulnesss in every scenario. Most of people waste their energy on wrong things. A very well written truth about the life…it is not ‘timing’ rather ‘time in’ the market which creates wealth. But sometime a person like me (who is a genuine long time investor) gets carried away by the TV commentators and (so called) experts showing whopping 63% returns in a week or so and starts doubting his own strategies of ‘time in’ the market. In that case you must stop watching idiot programs on idiot box. Rather than timing the markets, investors should time their investments n stay invested for a period where they can achieve their goals. Need your views on VCA (Value cost Averaging ) Vs SIP ? Value cost averaging is a strategy of spending more money to buy mutual fund units when the price is low and less money when the price is high. It is similar to SIP, though it can be more effective. It also requires a more active role from the investor as compared to a SIP. Say, in the first monthof your VCA investment, the cost per unit of the mutual fund that you want to buy is Rs 10 and you are putting in Rs 1,000. This will get you 100 units (Rs 1,000/ Rs 10). Now, assume that the markets did well and the cost per unit increased to Rs 10.50 by the end of your second month. At this time, the value of your investment would have become Rs 1,050 (Rs 10.5 * 100). Now, remember, the total money you need to invest by the end of second month is Rs 2,000(Rs 1000/month). So, you need not put in another Rs 1,000 this month. Your total investment this month will be Rs 950 (your target investment – the value of your investment; ie Rs 2,000 – Rs 1,050). With this Rs 950, you can buy 90.48 units (Rs 950 / Rs 10.50) that will take your total units at the end of second month to 190.48 (100 units in the first month plus another 90.48 units in the second month). Now, let’s see what happens when the cost per unit goes down. As per the table in the fourth month, the cost of each unit has gone down to Rs 8. That takes the value of your investment to Rs 1,523.84 (Rs 8 * 190.48). That means at the end of the third month you will have to invest Rs 1476 (Rs 3,000 less Rs 1523.84). Although the idea of VCA as a standalone idea but, one should not compare it with RCA (rupee cost averaging), after all there is no basis to compare oranges with apples. Both fruits have their own unique therapeutic values and similarly both investment styles have their own suitability for different categories of investors. 1) If one is actively managing the corpus to be deployed at each investment cycle, then it is better s/he directly invests in the stock of the selected companies he wishes to own. As active management only in the amount to be invested will leave one dissatisfied about the portfolio of the MF and the policy adopted by the fund manager at certain times. 2) For most people, especially salaried people, SIP in MF are a way of ensuring a forced and disciplined investment. They usually plan their monthly household budgets after accounting for such investments and cannot afford to invest more than the sum already set aside for monthly investments. 3) Even in case of people with non-cyclical incomes, like in professions or businesses, they may remember to deposit their regular monthly investment (or leave sufficient balance in the linked bank account). 4) Just imagine if there is a market crash (of say more than 5-10%) in a only 2-3 trading sessions but the investor (salaried, business person, or self-employed) does not have the larger sum required to meet the monthly target according to your formula, then there is a greater chance of frustration in the investor on missing the opportunity altogether. 5) Most importantly, I THINK (do not know), not many AMCs are providing such an instrument to retail investors. Therefore, all the more reason for increased hassles. If there are any such vehicles for VCA investments for retail investors, I would like to study them. Hope I will get an eye-opening response from you or someone in the know (probably Hemant or Anil ji). If you go through various posts of Hemant you will find that he prefers to have plain vanilla ice cream. He also advocates KISS ( Keep It Simple Stupid ) strategy. I am also in favour of simple investment products. My preferred mode of investment is monthly SIP. During week ends I check up market correction during the week. If I find that in a particular week the market has corrected substantially and I have some cash available I make small lump sum investments in addition to monthly SIPs. Yes sir, i completely agree with you. I have learnt from examples of many, including mine, that Vanilla is the best flavour, you can add anything to it, but you cannot subtract anything from it. Also, a KISS is always better to make up any thing gone wrong. Lumpsum investment not good… SIP is important…. I believe I have never said this “Lumpsum investment not good… SIP is important…. ” I think couple of times I have corrected Anil on this. We can not make generalized statements like this. Nobody can say that lump sum investment is good or bad. I have always maintained that SIP can always be done in all market conditions but while making lump sum investments one has to see where the market is heading. While it would be foolish to do large lump sum investment at 22000 sensex levels it will be a smart thing to do at 16000 levels. Briefly, SIP for all investors, lump sum for informed investors. It was not your statement but a generelised one. I am also doing SIP because I dont know the future. Even if i get a bonus which can be invested, just because i dont know what is in store for next month i do SIP rather than lumpsum. By doing so i am sacrifising some extra “TIME” in market for the whole money. I may loose or I may gain depending what way the market move in the SIP period. What if the market goes down to 12000? So should i put lumpsum (Increases TIME) or do SIP (averages RISK) to invest my Bonus. Personally I have made once a mistake of investing lumpsum when the market in middle east tanked 20%…. but after 5 long years i did redeem the whole with a further 20% loss. I tried for “Timing” and did spend enough “Time” as well but still lost money with one of the most proven fund house. SIP should be your normal mode of investment. Additional small lump sum investments should be done whenever the market corrects substantially and you have some cash available. Instead of investing large lump sum amount in one fund it is preferable to invest in three or four funds which are in your portfolio. Nice article, Hemanth. But as it is seen on any personal investment blog, blogger always includes the 2003-2007 super dream run, then great fall of 2008-09, then ultra super come back of sensex from 2009-10. This period was surely would look great for equity investors for 10yrs duration. 1. 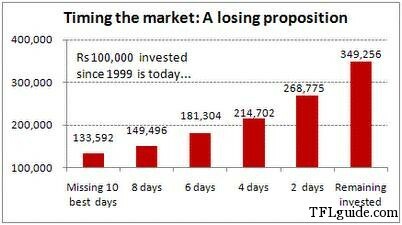 What was the SIP return in 10yrs from 1992 to 2002 when sensex gave a negative return over a period of 10yrs? 2. Equity market in Japan has not really given much even over past two decades or more. Was it possible to predict (!!) that two decades earlier? Then why are we so excited about India’s growth story. Except the great fall of 2008-09 and then super fast come back on the next year (which has made SIP look so attractive and popular), overall sensex has not gone anywhere in last 4yrs. If someone had made a one time investment in 2007, returns might not have looked that great even in 2011. But a SIP investment in the same 2007-2011 time period would give attractive returns due to dip in 2008-9. SIP works when there is DIP, what if we get a decade like 1992-2002 in sensex or anything like Japan. Can you please highlight why every equity lover is so excited about India’s growth story? 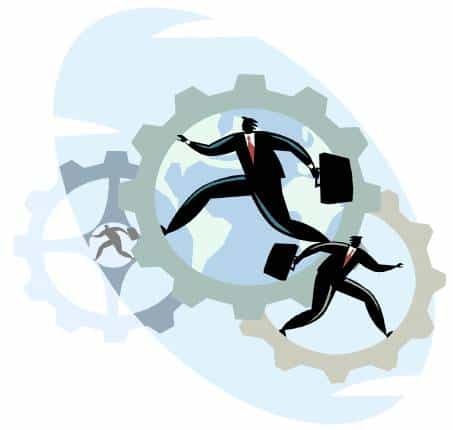 Two basic requirements for investment in equity are risk appetite and a belief in India’s growth story. If you don’t meet these requirements then you should not be investing in equity. Nobody can answer your what if questions. If you don’t have faith in markets then stay away. My first question was a pure calculation on past data which surely no equity lover loves to look at. The second question was reason behind so much hype about India’s growth story. How different it is from 20yrs old Japan? Is it just the effect of super cycle of Indian equity in last one decade or there are many other valid reasons. I refer to the following what if question. what if we get a decade like 1992-2002 in sensex or anything like Japan. Can you please highlight why every equity lover is so excited about India’s growth story? Each investor has to take his own call on investment. If an investor has faith in Indian Equity market and India’s growth story he will invest in equity. If he is equity hater he will not do. This is as simple as that. How can anybody pass judgement on how equity investors feel? I was watching the discussion to mature between two of you. I found that on one hand the points raised by Kannan are completely legitimate and are based on sound data (I checked it from a few sources including the BSE site charting section), while Anil ji’s responses are based on futuristic predictions and hopes of a new found energy in the Indian economy and being at the right place at right time. Here I would like to bring to the notice of all readers that when we invest in a particular MF scheme, we are not investing in the SENSEX or NIFTY directly, even in case of index funds based on these two. In case of index funds the fund manager TRIES to keep the allocation of stocks equivalent to the benchmark but has all rights to exercise his discretion and may give a particular script a little lower/higher weight that in the underlying index. Secondly, not all fund managers keep the number and composition of the portfolio exactly similar to the underlying index. They usually have a couple of scrips more or less than the index they track. This discretion is based on the more detailed and vetted information to which a professional fund manager has access and his GUT feeling that a particular business model and management may take the company higher and as a result the share prices may also move upward. This discretion is reflected more in case of funds that are not directly mandated to reflect a particular index as they have a wider horizon and thereby can exercise more discretion in selecting each stock. 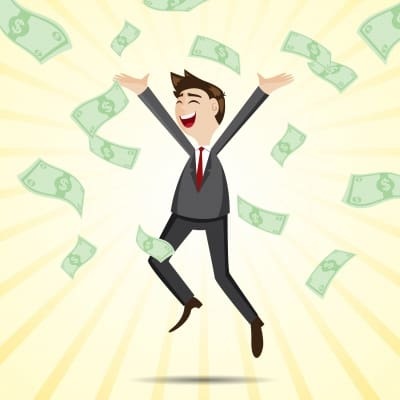 Even in the period Kannan has mentioned in his post, which he says that every planner shies away in mentioning, there have been some spectacular stocks that have created wealth for the investors and paid handsome regular rewards in form of dividends/splits/bonus – Tata Motors, Tata Steel, HUL, Bata, RIL, are only a few of them. The key to MF investment is to let someone professional and in the know of the things to manage your wealth. But it certainly does not mean that (a) you put all your eggs in a single basket (case for diversification); and (b) you can sleep off while someone swindles your money way (case for periodic review of all investments). I am not favouring MF investments alone – that is your style – what I am emphasising is that there was not even this kind of inflationary pressures and too many options available about a decade ago. When the choices are made available to a person this is not only good but also involves more active deliberations of choices for finding a suitable match. Life seems to be easier when one does have choices – like doordarshan – but we do not even know what we may be missing. Now that sounds logical, Mudit. Probably if you could support it with real data (using MF only) during that period to make it more apt. Even during worst time, some stocks may give positive return, but it would be a impossible task for a general investor to identify those beforehand. Hence would love to see returns of decent MF during any stagnation period. Whereas Anil’s response was more of an astrologer’s one . Equity market is not a spiritual thing that someone should have either blind faith on or hate it without looking for any logical explanation. Please do not get angry. This is the usual response from most of the equity lover. I completely agree with Anil n I also find some sense if he is talking like an Astrologer.Indian people still want to invest in equity bcoz this is the only way where we can successfully achieve our goals even though a common man has to take the risk..It should be a calculated risk though. Gone are the days where our parents used to invest in fixed deposit n used to get around 11 percent returns on consistent basis which was good enough to achieve their goals and along with that the inflation rate at that time did not rapidly progress as it is progressing now..these days the fixed deposit rates are fluctuating every year and the inflation rate is at the peak..We cannot keep on saving money in fixed deposit n get satisfied for a low percent return unless n until we have huge bank balance. The percentage of achieving our goals by investing in equity is more than that by investing in fixed deposits or guaranteed returns. Hence indian people have no option but to invest in equity. I would not comment on the ‘category’ of advise by any one as who am i to judge anyone. Moreover, it is one’s own convictions, beliefs and value systems and most importantly experiences in past that define our actions – whether related to a suitable match in marriage or investment vehicles. I would like to share my personal experience here – my father was one of the thousands who had taken a very strong beating in the Harshad Mehta scam to the tune of 50-60L at that time. Luckily, for us he did not take any extreme step like many others but neither did he liquidate his holdings in the shares of good companies. He sold some of family gold, property he had earlier acquired and some shares to pay off the debts that were created due to that sudden setback. This particular incident had a bearing in my mind as well and probably I thought of making money from the very same share market where he had lost his hard earned money. I never took any money from my parents of family emergency fund to invest; I have never invested any money in anywhere by taking even a short term loan for a even a paltry sum; I have saved money for the whole period of 2003 to 2008, in anticipation of a BIG CORRECTION in the markets to start investing in them; I started investing in markets in 2008 at around 15000 levels and continued it till they bounced back to 14000 levels the next year; since then I did my further investments only in 2011 (July onwards) when there were continuous slide in the markets; I never invested in a large quantity in a single scrip or on a single day, not more than 10-15%; I sold many shares at the peak of the market last year (and whenever I needed cash to meet some big expenses). These all actions were a result of my own experience and convictions. One more thing about being hopeful about Indian equities is that the period of 1990s was the time when the economy was starting to open up, many companies were facing competition from the new entrants from the matured western markets, so not too many big-bang performances could be seen in the markets. Next, as far as I remember, the Indian currency and financial markets started opening up in real sense only in late 1990s and early 2000s. This also added to the chase of limited number of good scrips by the huge sums that started flowing into secondary markets. One thing that i would like to bring to notice to all readers is that I heard in a TV interview of ex-SEBI chairman C B Bhave and also by the current chairman U K Sinha, that the overall retail participation in the Indian securities market was more than 25% in the period before 1996 that has shrunk to less than 10% today. Also the technology was not available to most investors therefore the volumes in the markets were very negligent. Now with infusion of foreign capital and technological reach of markets, the number of trades have certainly reached a very high level when compared to those periods. So in my opinion it would not be prudent to compare both the periods at all as that war was fought with bow-arrows and swords and this battle is being fought with cruise missiles and nukes. Another thing is that the opening up of economy was felt by many people in the change in their consumption patterns that were limited to the upper-middle classes. It would have taken some years to let the benefits of rising incomes trickle down to masses (lower-middle and lower classes) to actually raise the consumption levels requiring companies to invest, produce, market and sale in larger numbers of whatever they were producing. I am optimistic about the growth prospects of economy as a whole in coming decade but not too much upbeat on the CONSUMER theme (read Jubiliant, VIP, Pantaloon, etc.) and still invest in core sectors like manufacturing, auto, banking, etc. Because even to produce a VIP suitcase there is need for machines/finances/infrastructure and those are the companies that will never (ever is up to next 20 years or so) go out of flavour. One last thing, One MF scheme I know about which has consistently performed for more than 25 years (paid handsome dividends) by their own admission is UTI MF Mastershare (Humne India ko MF ki Bhasha Sikhayi Hai). There can be a few good funds from earlier MF houses like Birla Sun Life and so on. Monthly SIP from Oct 1992 to Oct 2002 in UTI Mastershare -Growth gave negative return whereas monthly SIP in the same fund from Oct 2002 to Oct 2007 gave decent positive return. So your claim that a good MF would give decent return in long run even if sensex hovers around same range does not look correct. I purchased UTI Mastershares when this scheme was launched. At that time I had not even heard about SIP. It was normal to make small lump sum investments in mutual fund schemes whenever some cash was available. I never bothered to see what the market was doing. I even did not bother to monitor my investments in mutual funds. Buy and hold was my strategy. For me long term meant a time horizon of atleast twenty years. I admit things have changed a lot now. SIPs have become popular. People are regularly monitoring their investments. A lot of tools are available to monitor funds. I don’t think many people monitor the funds over different time periods in the manner in which you are doing. My feeling is that probably only Value Research does this type of study. My all comments must be taken with the perspective that I am only 4-5 years old (in the markets) and i follow them to out of interest not for research, so I may not get many of the facts straight. Mostly in my comments and replies I try to avoid the factual data as I cannot take out much time to gather and analyse it, but as i am a voracious reader I build some perspectives and beliefs that I share with everyone. I completely agree with the facts you have presented. I did not say that I got these figures, it was an advert by the UTI MF that gave the data, which i quoted. Secondly, Equity MF investments can be broadly divided into two categories of dividend yield and capital appreciation. Probably UTI Mastershare failed on the latter count but as per their advert they have done reasonably good on the former. And I think that the concept of SIP probably started only a few years back. Thirdly, It was only one example – There were more fund houses back then like the Birla Sun Life and probably they might have managed the monies of their investors far better than the UTI scheme. I am no authority on it and hence only give my perspective. Lastly, The markets can move only when there is money to be invested in them. Big time DII investments in secondary market got permissions in late 90s and FII was opened up more in early of first decade of current century. I am not very fond of astrology although my wife is but I never question her faith in astrology as I think it is a very personal thing. On spiritual note I would like to point out that I am not emotionally attached to any asset class be it equity, debt, property or gold. I firmly believe that one should have proper asset allocation based on factors like income, dependents, age and risk appetite. My exposure to equity is very small. I do not have a demat account. Whatever exposure I have to equity is through mutual fund route. So I am not equity lover by any stretch of imagination. My initial investments in mutual funds were mainly in UTI schemes with the limited purpose of tax saving. I still remain invested in those schemes and I am quite satisfied with the returns I have got. I see this statistic of “missing the best X days” every where. Could you explain how this is arrived. Is it that only the index movements of these days are removed from the data? But I also wonder what would be the result if you happen to “miss the WORST X days”. If you can tweak the data available with you and add this result also it would be interesting. This concept of missing best and worst days is only theoretical just to highlight a point. It has no practical significance as no one can actually invest on all best and worst days. I am fully aware that it is just theory. But wanted to know how this theory was arrived at in the first place. If you are talking about calculation it is very simple. Daily returns of sensex are taken & worst days(maximum negative returns) are removed. Another very interesting facts and figures, and a sound concept of staying invested. For a thick-headed person like me, I quite did not understand the second graph “A losing Proposition”. I got the message but still trying to understand the graph. Check my reply to Sreekant. Yes Anil, proper asset allocation is what we should look for. So, as it seems to me that the MF that you mentioned were not able to produce anything during dull period of sensex. Let me know if I am missing anything. Thanks for you compliment. As far as data and facts are concerned pls see my reply to a post up above. I am now going to share something which is going to please you. I do not know whether you have read this book or not. I have read a few pages of the book-Success Stories.From what I have read so far it appears that the author is an equity hater and believes that investment in real estate is the only way to create wealth.I am sharing some comments of the author. There are millions of people today, putting money into instruments that lose money.People who have never invested before, taking money out of their savings and putting their hard earned money into mutual funds, generally an investment vehicle reserved only for the rich and financially sophisticated. 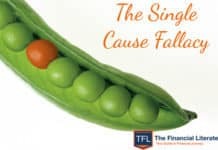 I have often warned investors about the perils of the stock market and how risky mutual funds are.On several occasions, I have been slammed by financial commentators for critisizing mutual funds. 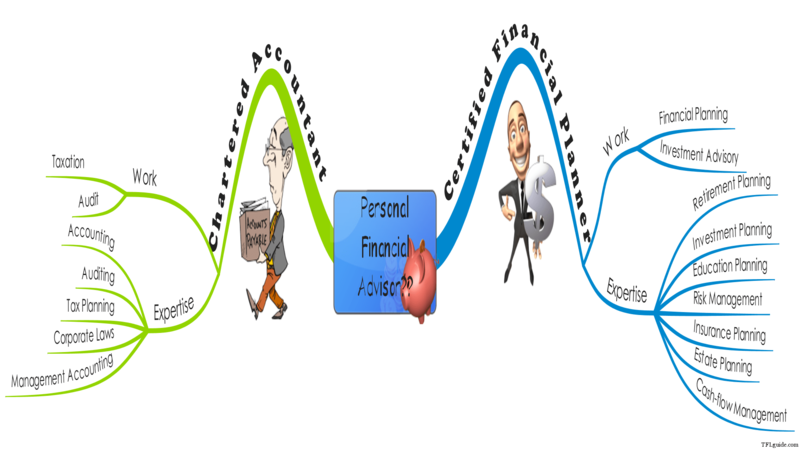 I am also certain that there are many people who wish they had followed my advice rather than their financial planner’s advice.The reason so many people do not do well financially is because they take financial advice from financial planners. I still hear people saying- I am waiting for the market to come back. I also see financial advisors who gave bad advice before the market crash still handing out the same bad advice after the crash. They are still saying – Invest for the long term, diversify, buy and hold.They also continue to say the market goes up on average 9% every year.The sad thing is that there are still millions of investors who continue to heed that advice, even though there is overwhelming evidence that the advice did not work.How people continue to follow bad advice or, even worse, get paid for handing out such bad financial advice is beyond me. Through out my post, I have tried to show that equity MF can give negative return in long run as long as 10yrs. I know you have mentioned that ‘u believe’ long run is 20yrs or more. But In today’s market, any PF advisor would say equity MF is good for at least 3yr. Then they would show last 3yrs and 5yrs SIP return. Those attractive returns are somewhat misleading standing in 2011 as those includes great fall of 2008. Let sensex hover around 17k mark for another yr (i.e. till 2012 end), all Equity MF advisors would start saying equity MF investments are good for at least 5yrs. They would probably then show the SIP returns of 5yrs and 7yrs (instead of 3yrs and 5yr) to include 2008 in their calculations to make the return attractive. My claim is that whenever someone is projecting any statistics (let it be related to investment or anything else), he should be honest enough to project both the positive and negative side of it. I feel great when someone shows me stunning return of SIP in equity MF from 2002 to 2011, but, I would have felt greater had he also provided me the similar statistics for 1992 to 2002 at the same time. At least this would set up the expectation correctly. Again I am not an equity hater. I feel diversification is the most important factor in investment and “all” of them are equally important. It is like a good cricket team would need opener, middle order batsman, wicket keeper, fast bowler, spin blower. You can not have good team having only one type of player. I am in complete agreement with what you have said now. Perhaps I misunderstood your earlier comments. I have read many books of Robert Kiyosaki & his love towards real estate is well none. Even he hates Financial Planners or Financial Investments – which came to public after his fight with Suje Orman. I actually couriered that book so you see other side of the coin. The trick is to separate fact from opinion and do your own research. Don’t rely on any one person for all of your information – not even me. I read around 50 pages of the book and then left it as my patience ran out. Hopefully, I will complete the book after some time. Presently I am reading a book about seven investment sins and I am thoroughly enjoying it. I will let you know about this book after I finish reading. It isn’t what the book costs; it’s what it will cost if you don’t read it. I have always been fond of reading. But I started enjoying books related to financial planning only after I got the book – Rules Of Wealth from you. Very good article. Clearly explains the benefit of staying invested in equity for the long term. I am a firm believer in this concept, and hope to leverage it, to enable my early retirement goals. If I have invested by buying 100 XYZ stock of Rs.100 each, total of Rs.10000. In a month’s time, the stock rose to Rs.150 each and my investment value became Rs.15000 and I exit by making a profit of Rs.5000. Then, I buy the same stock when it drops to the level where I purchased before (around Rs.100). How will this get me into making low profit for not being invested in the market? If you have a better example, I would appreciate that as well. Thanks in advance. Your Example is good but not practical. How do you know that stock after touching 150 will go back to 100 – what will happen if it will go to 1500?? We have to understand the concepts of lazy money and the power of compounding. Compounding has been called the 8th wonder of the world. In the example you have cited you are behaving like a trader and not an investor. A trader follows get rich quick principle whereas investor follows get rich slow principle. long term wealth creation is a very slow and boring process and patience is the key. Moreover when we are investing for long term we must overcome the temptation to book profits and remain invested to have a nest egg. No money should be taken out unless it is needed or it is to be invested in a better fund. Otherwise the money you withdraw remains lazy money till it is invested again.The money you invest grows in the long term by compounding. Dear Anilji, Agree with you completely. 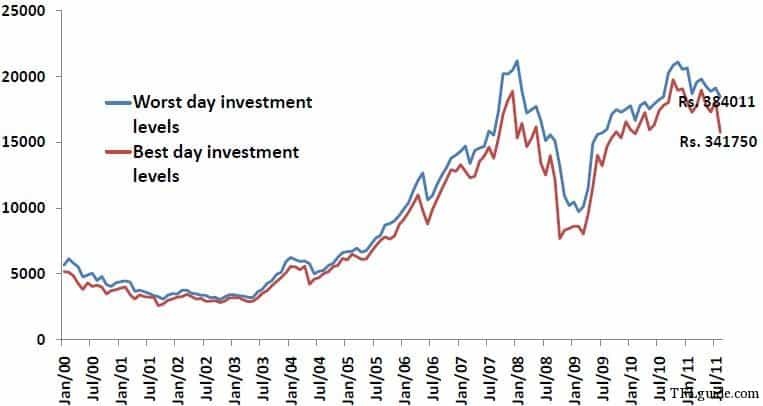 But how does remaining invested “for the best days” makes difference was my question. By the term “best days” I believe the meaning is “when the market goes up or bullish”. Still confused on that front. Hemant has mentioned that if you invest through SIP for a long time then even this investment on best and worst days will not make much difference to your returns.